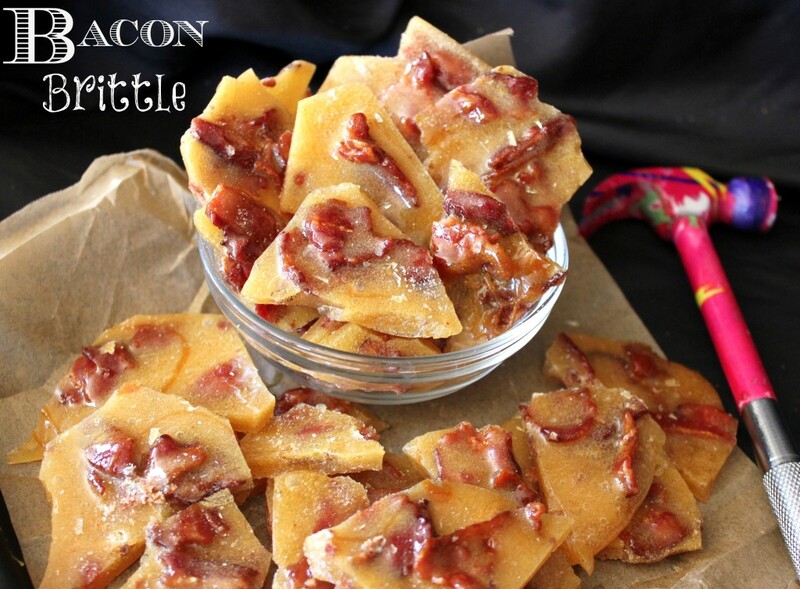 Move on over Peanuts..Bacon is in the house! 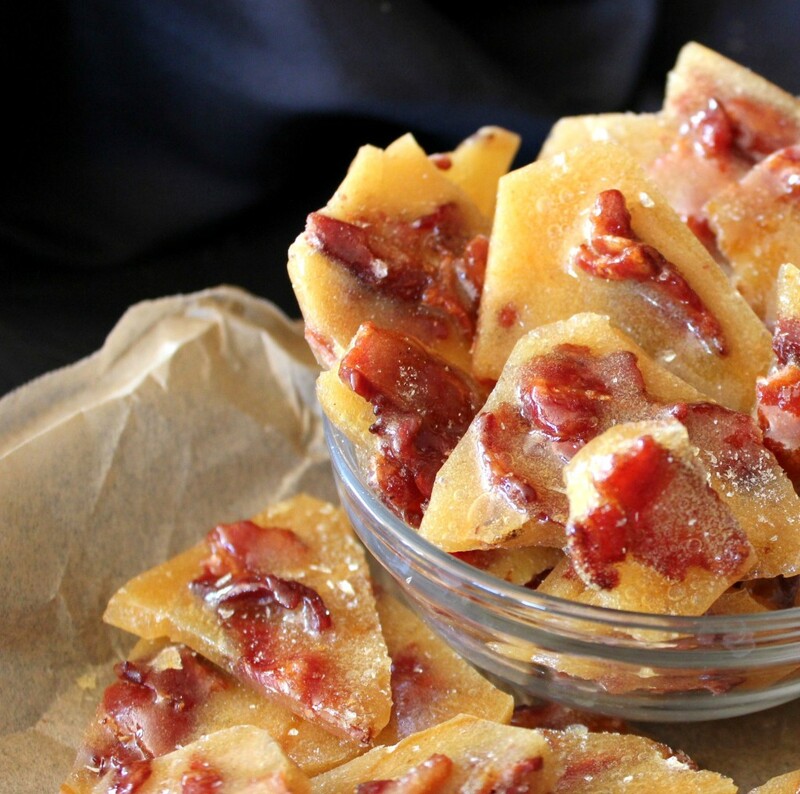 Ohh yeah..now this is a snack marriage made in sweet & salty Bacon heaven! Brush a 9×13″ Baking Sheet with butter and set aside. Combine the Sugar, Corn Syrup, Water and Salt in a medium saucepan. Bring to a boil over medium-high heat, stirring until the sugar has dissolved. Cook, swirling occasionally, until mixture reaches the softball stage on a candy thermometer (238 degrees). Stir in the crispy and crumbled Bacon, continue to cook, stirring often so the Bacon doiean’t burn, until the mixture is amber in color! Carefully stir in the Vanilla and Baking Soda. The mixture will foam up in the pan. Pour the mixture onto the prepared baking sheet and quickly spread it evenly. Set aside until it’s completely cool. 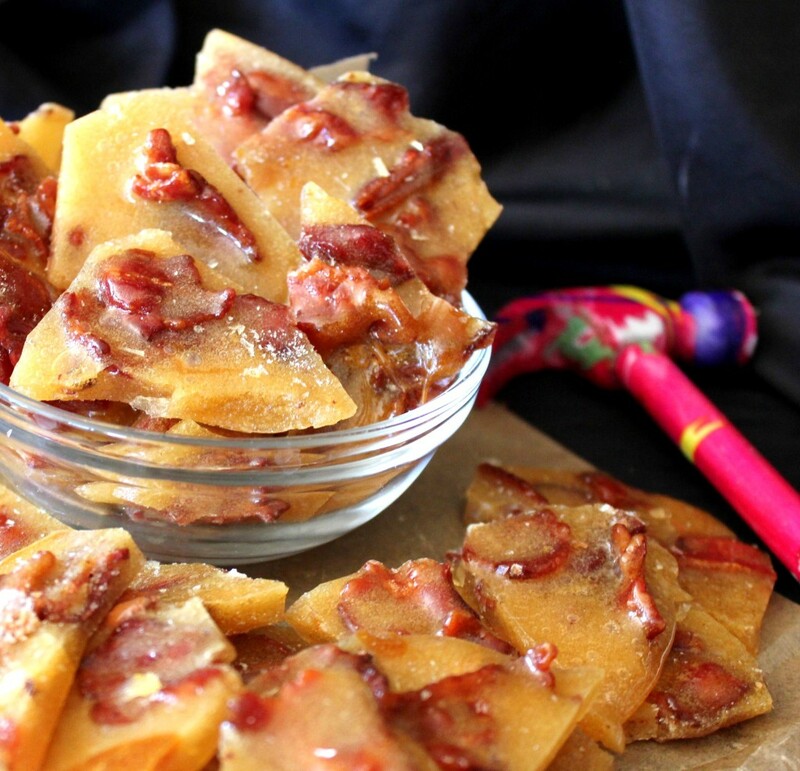 Gather everyone around and take turns breaking the Brittle into pieces with a hammer. Giggle, Eat..Repeat! ~Enjoy! 1 question. Have you tried to make this into rounds? If I spoon it out I know normal sugar candy will make a round.. I need to make them this way in order to sale it at a festival. I know some older women in my community us metal pie pans to pour theirs in so it will be perfectly round, but I need to make them smaller than that just in case they do not go over well…. Before it hardens sprinkle with chocolate chips, cover with another pan for about 5min until the chips melt. 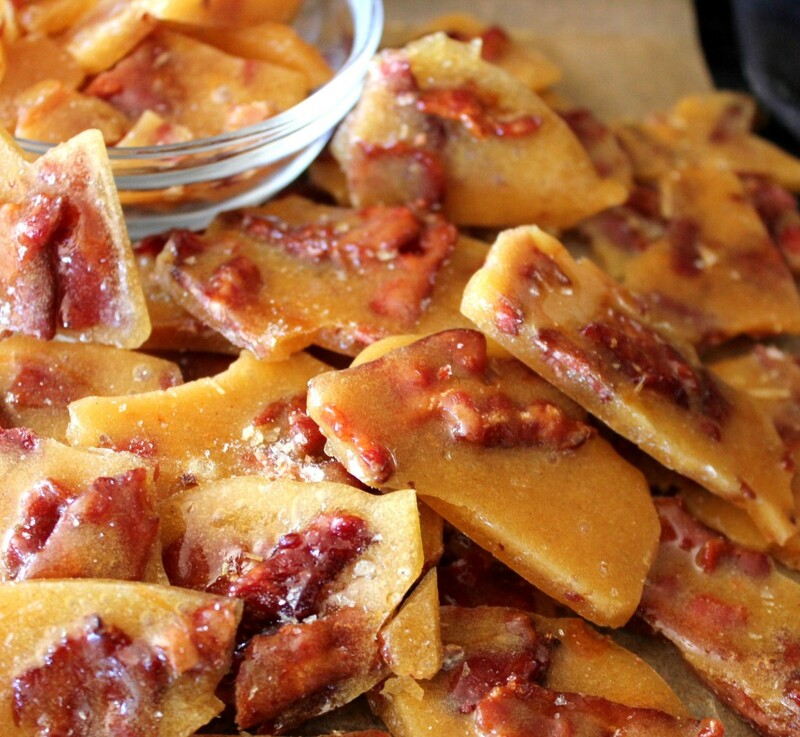 Spread them on top of the brittle, put in fridge to harden then break. No need for dipping. Just wasted a pound of perfectly good bacon on your pathetic excuse for a recipe! 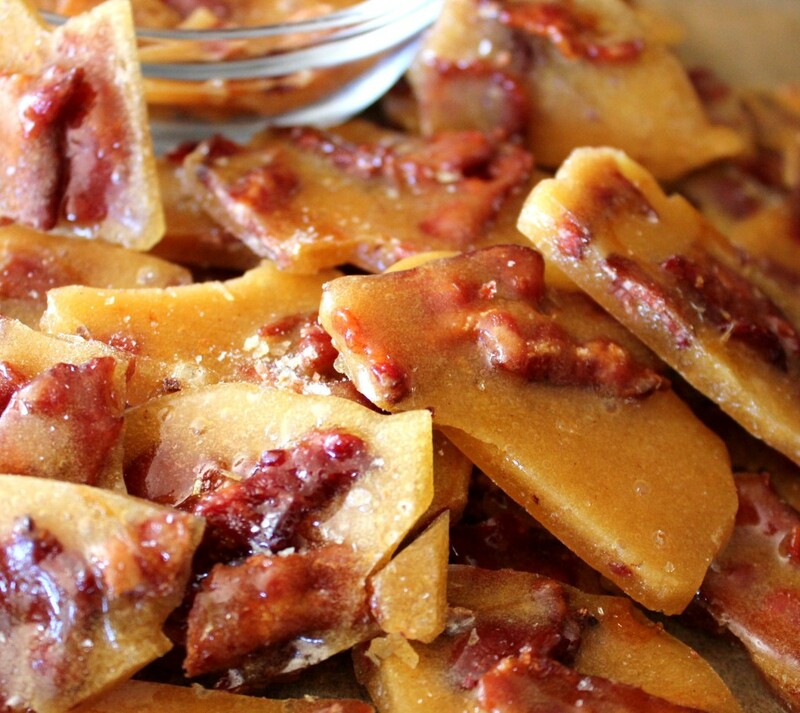 It’s a time tested brittle recipe from good housekeeping, with bacon in it…what went wrong? For best results, you really do need to cook the mixture to 300 degrees. The way sugar reacts with heat is simple science. If you turn up your heat too high, it will burn. If you don’t cook it long enough, it will not firm up. Candy making takes time and patience. I think that’s why people make it for holidays and special occasions….because it’s kind of a pain in the neck! Hi! Made this for my fil for Xmas, but it didn’t harden…what did I do wrong? Any way to fix it? I think I will just have to try again? 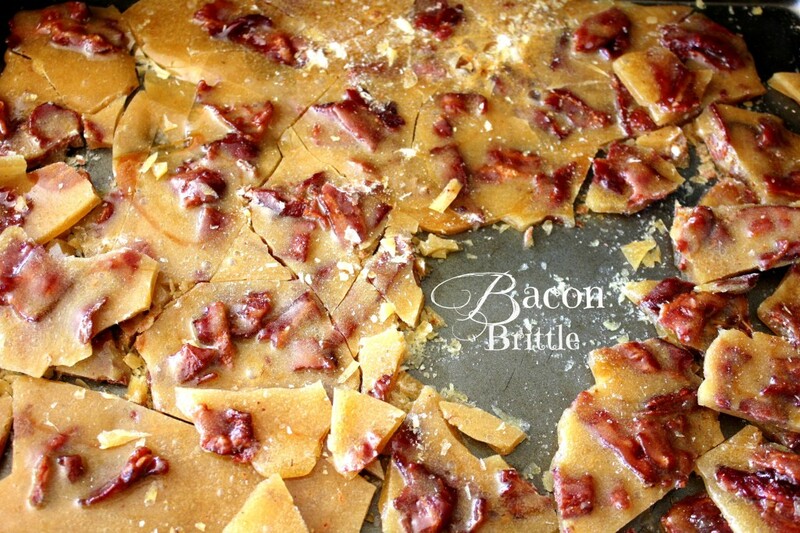 SO many factors go into the perfect brittle, I always struggle with it too. Just keep trying, it could be altitude, temperature variations etc. I haven’t made this since.. haha! 😉 Happy Holidays! 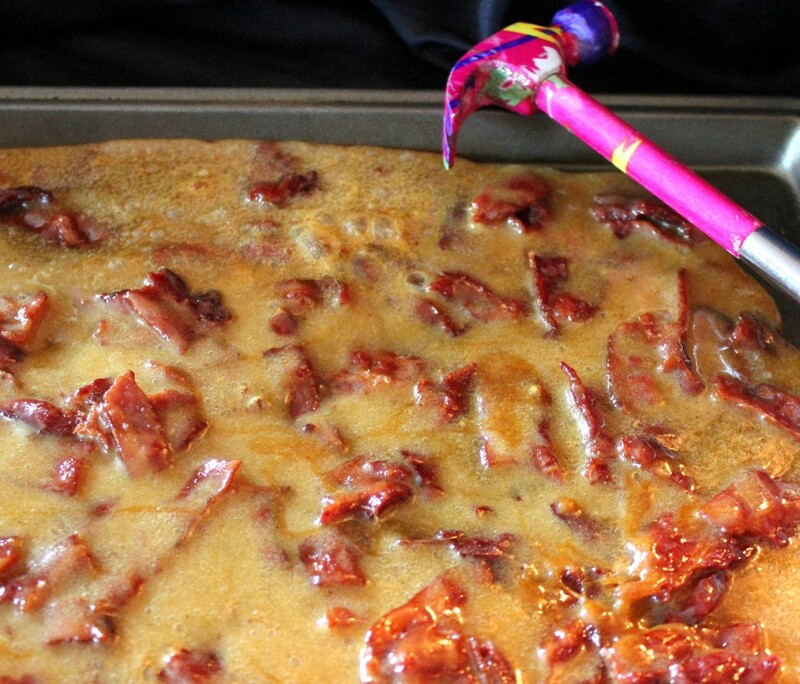 Having lived in Vermont for over twenty years, I consider maple syrup a magical ingredient. I subbed in the real stuff for the corn syrup in this recipe and it worked like a charm. I believe the fat from the bacon works as butter does in most brittle recipes, but I did cook the syrup to 295° since it was already amber colored from the maple syrup. Yum, yum!